The flag was based on the flag of the pan-Arab revolt against the Ottoman Empire. 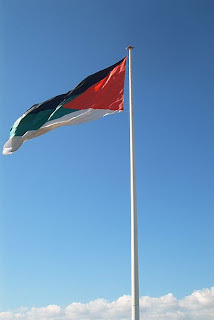 The Arab Revolt flag was a horizontal tricolour of black, green and white, with a red triangle lying on the hoist. 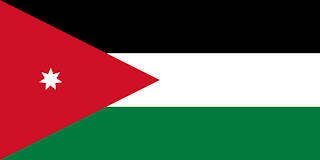 The Jordanian flag was adopted at independence in 1946, when Britain finally withdrew from its protectorate. The flag draws heavily from the pan-Arab Revolt flag, with a few minor alterations. 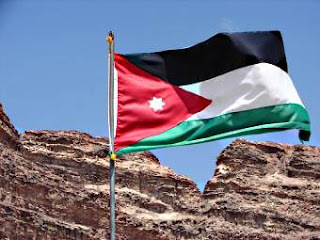 The horizontal stripes no longer run black, green, and white, on the Jordanian flag, they run black, white and red. On the red triangle, is now a white 7 point star. Star is significant, in that the seven points stand for the 7 verses of the first surah in the Qur'an, as well as being for the 7 hills on which the capital city, Amman, is built.